It's been some time since my last Korean cosmetics haul (it has, right? uhh) and I'm back with another! I stocked up on products (and clothes) before the upcoming school year. I don't start classes until the 9th, see. I'm too busy to (frequently) shop during the school year, so hopefully these will last me until the Winter break! The majority of these products were purchased by myself at Pacific mall (a huge asian mall), eBay and Eaton Centre (a mall in Toronto). Only the Etude tint, colorpop and Laneige pack were sponsored - thanks, ibuybeauti! 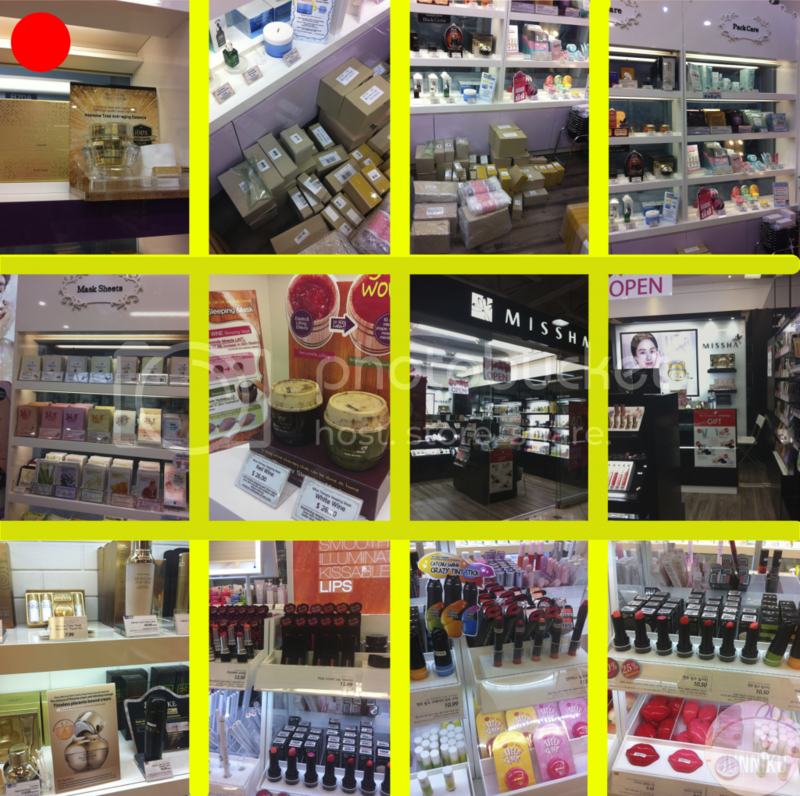 The picture below are taken all at Pacific mall: Holika Holika, Missha and Tonymoly. All of the stores had "Back to School" (B2S) sales, and there were lots of products marked down! I personally don't think it was marked down enough for me to go insane, but meh - better than original retail price, still more expensive than eBay. On the picture above, do you see the red dot on the upper left hand corner? That was a product from Holika Holika - the packaging was absolutely gorgeous and elegant! It looked so expensive, so I was curious and asked the SA how much it cost. Anyways - to the haul! I'll start off by showing my Korean (and a bit of Japanese) cosmetics, and then finish off with my "Back to School" clothing haul. Somebody save me - I have a true addiction to sheet masks. I kid you not. This stack was supposed to be bigger, but somehow I managed to summon all the willpower I had to not buy an extra 20. 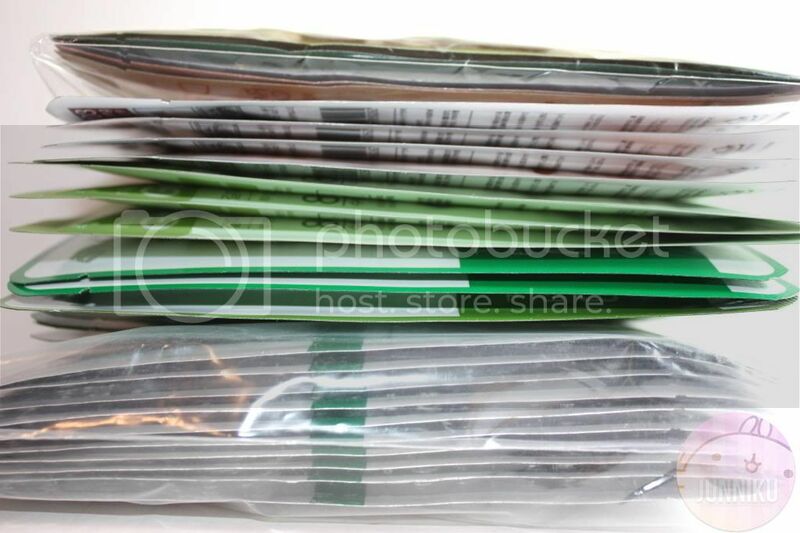 These face masks are from a variety of stores: C+F, Dermal, Tonymoly, The Face Shop, Skinfood. 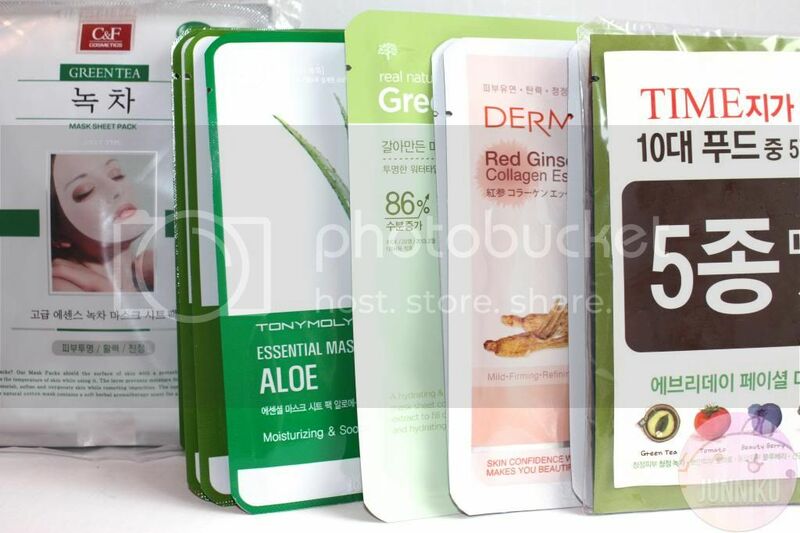 To be honest, I'm not a really big fan of Tonymoly masks. I find them just "average", and nothing that really benefits my skin. It's just nice to use every once in a while, that's all (+my addiction). The C+F and Dermal masks are my HG. 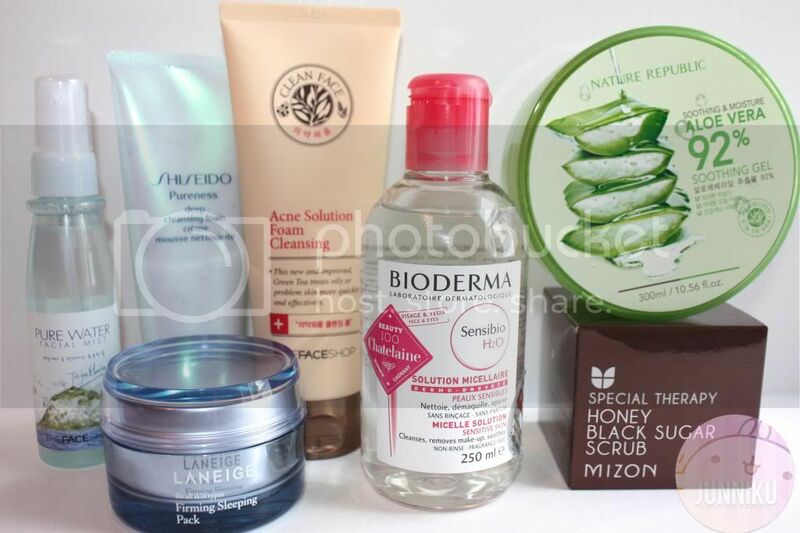 I absolutely love them - and they're often much cheaper than Tonymoly, The Face Shop, Etude House, etc.! I bought the The Face Shop "jelly jello" lip tint and the Tonymoly lip scrub at Pacific mall. The jelly jello (love that name) tint was only $4 or something! TFS was having a "Back to School" sale, and I was able to grab this for 40% off the original price. The Tonymoly lip scrub was pretty expensive, though - no sales on that particular product. I think I paid $13 (with tax)? It's pretty pricey for such a tiny little thing. I know Bioderma isn't Korean or Japanese, but while I was buying the Shiseido, I decided to pick this up as well. It was on sale! How could I resist?! I probably have way too many mists now (I rarely use any), but I also picked up that The Face Shop pure water facial mist. Why, I do not know. 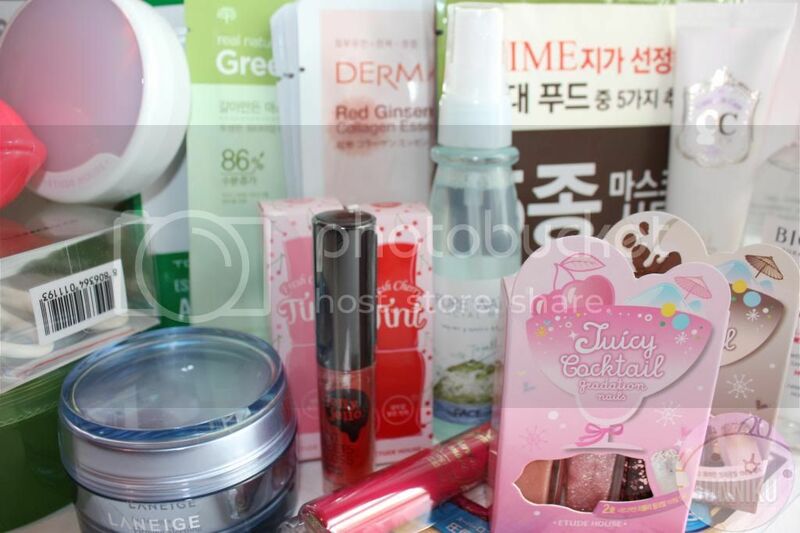 So many people were crazy about my last Etude House CC cream giveaway, and really showed interest in it. I hadn't used a CC cream before then, so I was curious about all the hype. My cousin went to Korea and while she was there, I asked her to pick this up for me! 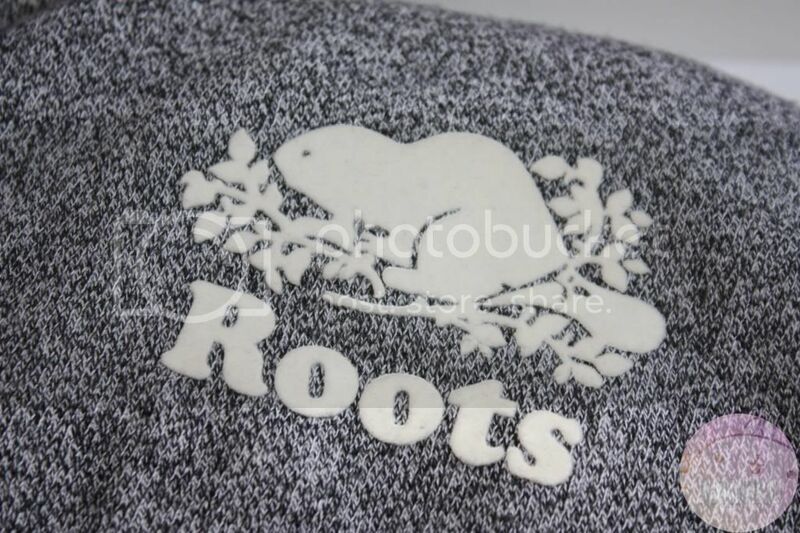 This is the silky version. 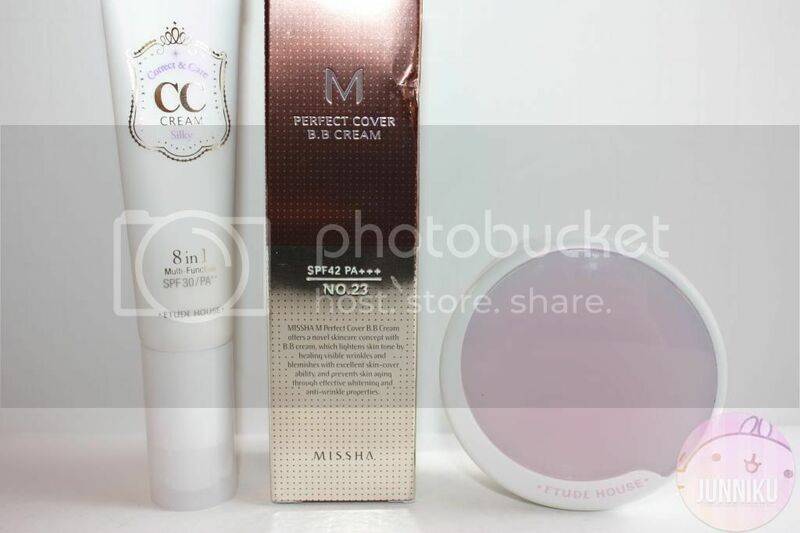 The Missha BB cream is another repurchase for me. It doesn't match me currently (thanks, summer sun) , but I do find that it's alright in the wintertime. I just bought it... really, really early. The Etude House Balm (the circle thing) is a random purchase for me. I do not know why I bought it. I didn't even check the colour before buying it (I bought "02 natural beige"). I'm scared. .-. The Face Shop eyelash curler was a measly $2.75. I used it before, and it was decent. It's a pretty good deal, and there's nothing to complain about, yay! 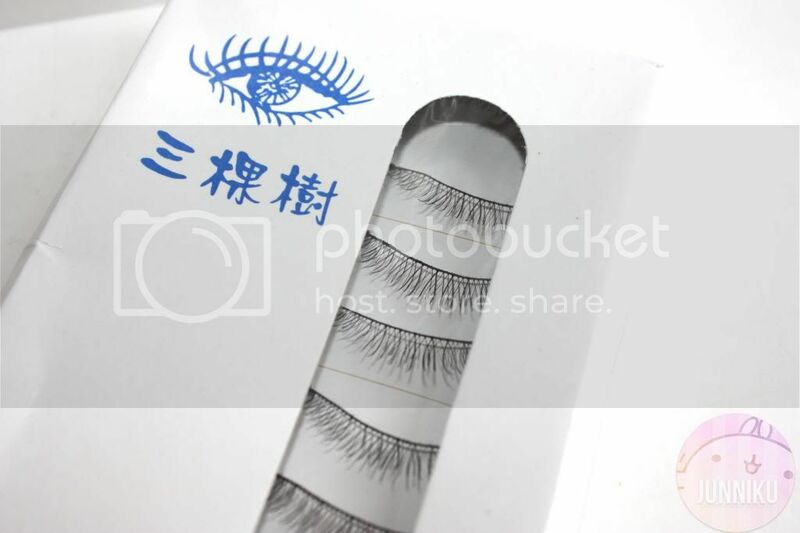 The eBay eyelashes were a first time buy for me - they were approximately $1 per box. PER BOX. You really can't go wrong with $1, can you?! The Kiss Me mascara is also a repurchase, my HG mascara! It was $20, but I think it's pretty worth it. I haven't had good experiences with drugstore mascara here (Maybelline, etc), so meh. 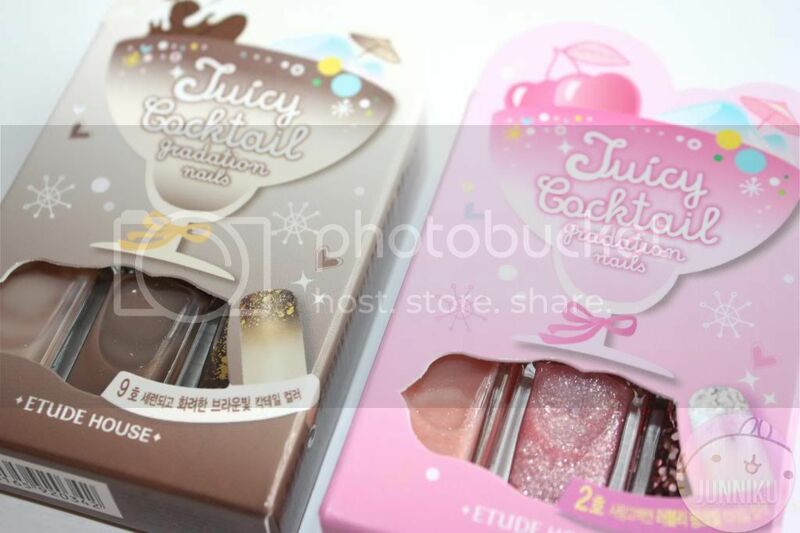 These Etude House gradation sets (09 and 02) aren't bad! They're pretty amazing, and I really, really like them! I have several other sets, so I'm not that new to these. I've never tried these particular colours though, so I'm excited! 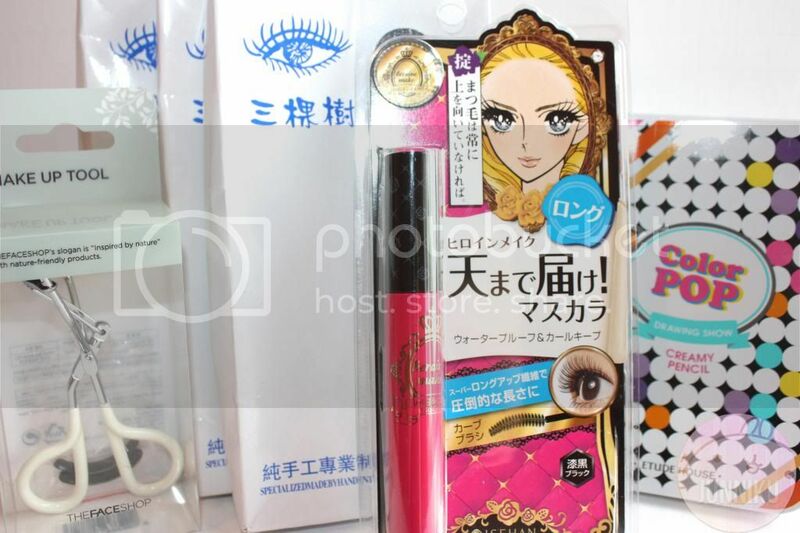 Okay, so that finishes up my Korean (and Japanese and "Western") cosmetics haul! I think I went a little overboard, but... YAY OVERBOARD. Onto the clothes that I bought! I didn't take detailed pictures, it's just basically a sneak peek. I'll most likely start having OOTDs on my blog soon, and these will be in them! These clothes were purchased by myself at Eaton Centre. It's a bunch of stuff from Club Monaco, F21, Roots and Abercrombie and Fitch (they have pretty stuff sometimes, I cannot resist). They had a freak sale a few days ago, and I went freaky. 50% off already marked down items? Count me innnnnnn. 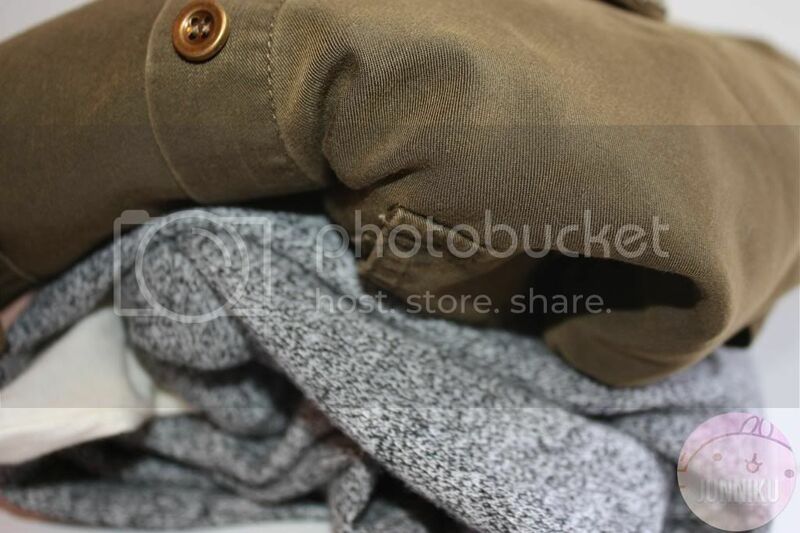 Some of the clothes I bought weren't 50% off though, sobsob. T__T They were just too pretty to wait until a sale came around. The scarf is SO soft, it's like... so soft I can't even. And it's so full as well, so poofy but thin! Y'know what I'm talking about, right? And it was $10. Original price: $80 or something (can't remember). 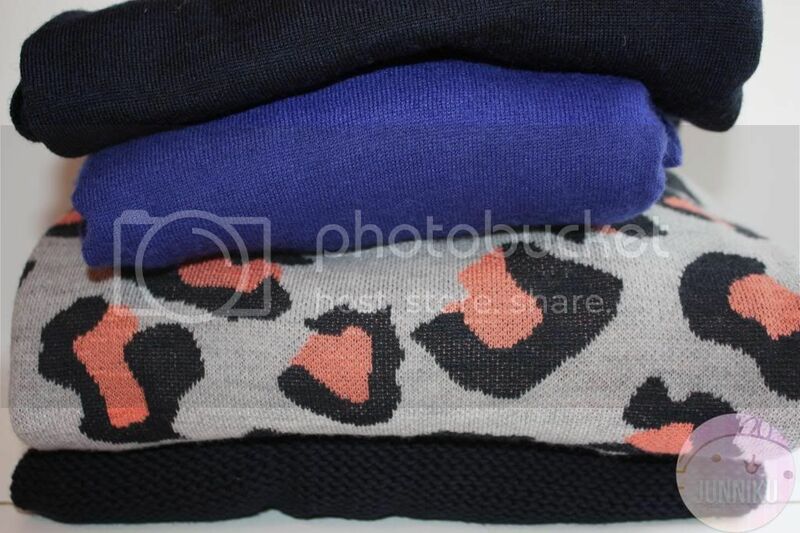 I bought 2 shirts, and a couple of jeans (not all of the jeans were pictured... because... why?). The sparkles and stuff on the blue shirt was just omg. I cannot get away from the sparkle. 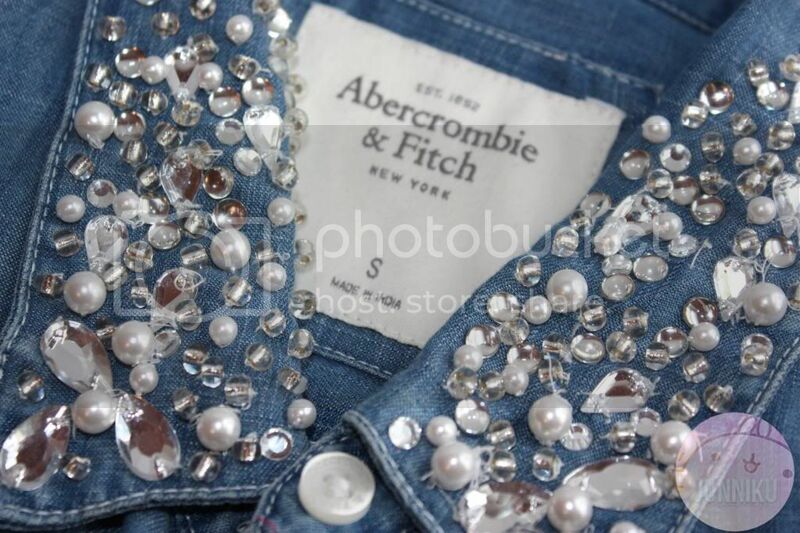 True, they're very shoddily sewn onto the shirt - but... sparkles! Me likes The Shiney! 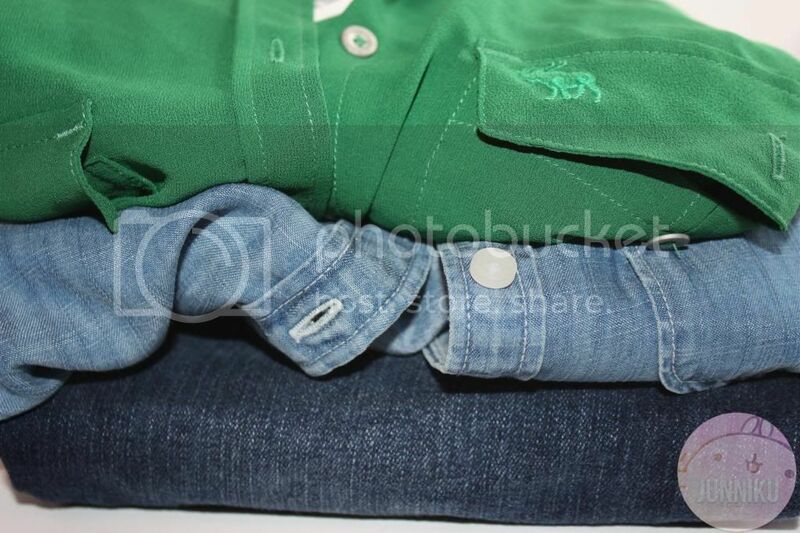 The green shirt picture came out a bit weird, but... hm! I'm not sure why the pictures of my green F21 shirt came out so... "sketchy". No idea, but in real life it doesn't look like that! I love it, it's one of my current favourite shirts (wearing it right now hehehe). The Roots sweatpants... these are my first pair. Everyone raved about them, but I never really "got" the craze until now. Why are they so comfy?! These are for my hobo days, and those "its too cold to go out to school but I need to in order to get an education but argh why" days. Those Forever21 socks! How can I say no?! (I can't seem to say "no" to a lot of stuff, hnng). They're adorable! A piggy! A kitty! Made in Korea! Me likey. They were $1.50, too. *u* Hohohh I'm gonna go buy more soon. 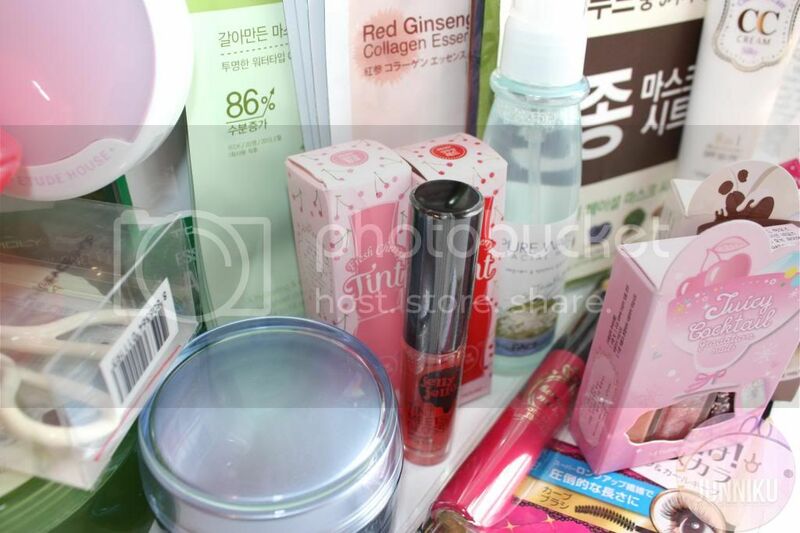 Well, that's it for my Korean cosmetics and Back-2-School haul! What'd you buy in your last haul? What'd you get for B2S? What do you want me to write a review on? Am I asking too many questions? ahahaha is that what you bought when you went crazy at club monaco when they had a sale? Love the faceshop eye curler! And really wanna try the bioderma! I still haven't gotten anything for B2S, but I don't think I will go on a shopping spree since I have been buying bits and pieces over the summer. :x hehe love the clothes you got! hehe I want all of it ^_^ I love the sparkly top and all the face masks! I'm an addict too :P What was the expensive $200+ product? I didn't know Holika Holika made such expensive products! Wow! Great shopping haul! (>_<) I'm curious about the BioDerma? Never heard of it before! I hope you like the mist though. . .I thought it was okay but, I've moved on to other ones (>_<)! You shop to you drop and got amazing items well done. Really great haul. Im also addicted to masks, tried leaders masks lately? Ohhh you are making me feel jealous! I really wanted to try those crayons and lip tints. 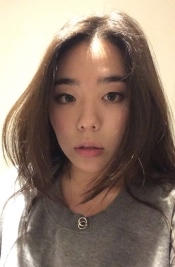 I really need to do korean Makeup and SkinCare haul! Que hermosas cositas te compraste, yo quiero ir a esas tiendas :D ¡Ciao! To be honest I never hauls, usually buy a few things during the month and so I never do big hauls, I'm buying as needed, or some other product that catches my attention. I'm so jealous you have all of those stores near you!! （；へ：）lol Great haul! All of the makeup is so pretty. It is such pretty packaging. I still haven't gone completely loco with my back-to-school shopping yet but I might when fall/winter items show up more in stores. lol I rarely use my facial mist either but for some reason I am tempted to buy more every time I visit TheFaceShop XD I just like the feel of it when I spray it on my face and the packaging a lot of times. Daaaaaaaaaaaaaaaaaaaaaaaang. O___O lol!! June you are an impulse buyer, I counted at least 3 times where you said you didn't know why you bought it! hahaha, you're so funny! ^___^ I've been super interested in the Juicy Cocktail nail gradient sets, they're so cute! Also, those lashes look bomb! ^^ Awesome hall! I wish we had a huge Asian mall here in the states T^T I'm tired of paying for shipping lol. So much stuff * A*. I haven't gone to pmall in awhile, but I want to go just to get more masks OTL. 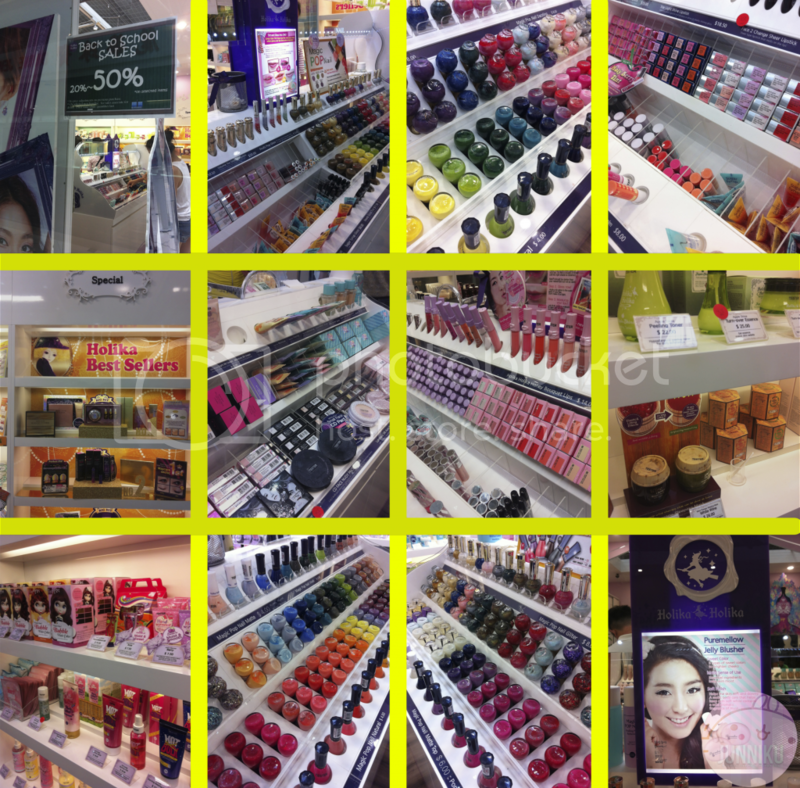 cosmetics heaven! i don't even know if i could stop myself if they we had a huge selection of asian cosmetics here. love your purchases. 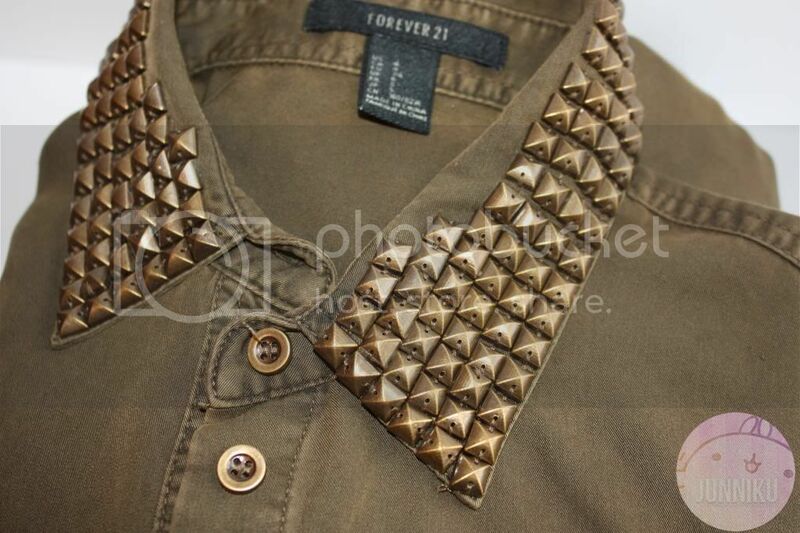 great back to school haul as well, love the denim blouse with the diamante on the collar. 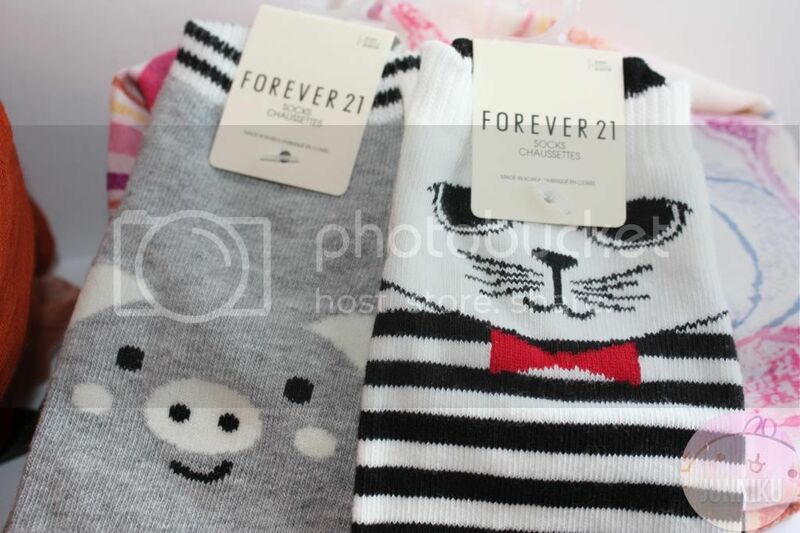 Forever21 makes some of the cutest socks. Although the quality isn't great, I just want to get one in every design. 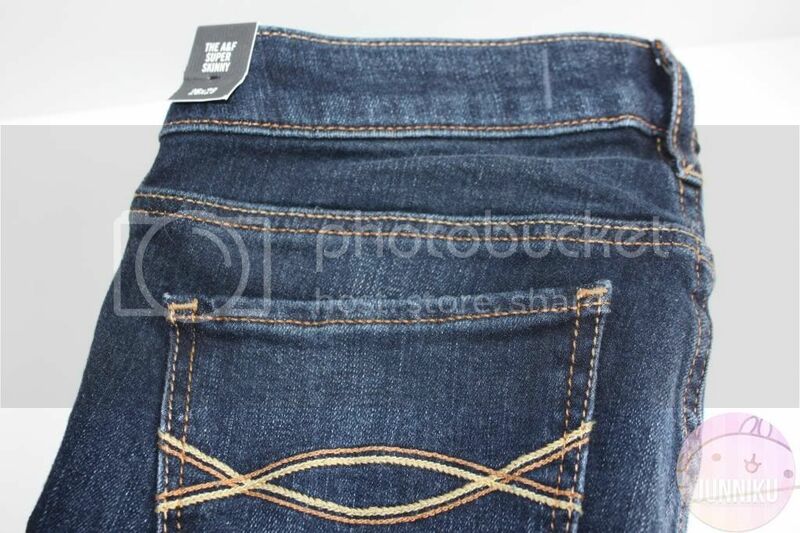 Also, I've noticed that Abercrombie's quality has been falling lately, so I've held off buying from them. 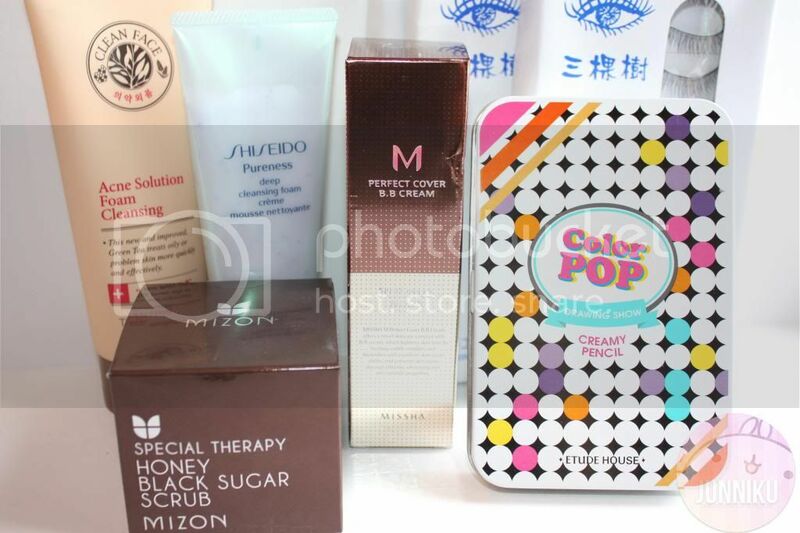 Please review Etude's Color Pop, the round thingy you bought randomly and The Face Shop's Acne Solution Foam Cleansing! asksdsmfls I love your haul! Especially the Heroine Make mascara! LOOL - and huh a sheet mask virgin?! How can this be?! You reallyreallyreally should try C&F masks (Galleria supermarket sells them) or Dermal masks (H-mart sells them). They're much cheaper than other brands like Tonymoly, Etude, Holika - but I swear they're AMAZING. yoooooooo this haul looks so nice! Love it when people really do a huge haul!! Its so nice to see. Have fun going back 2 school with yo nice products gurl!! 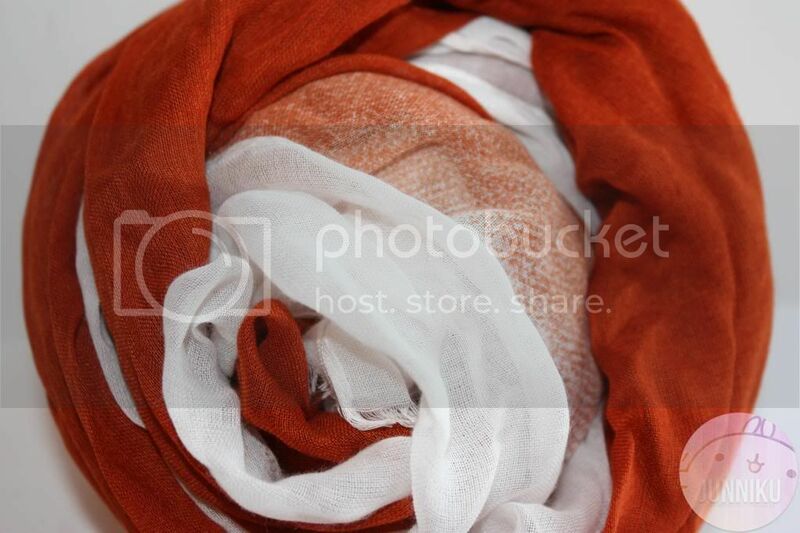 A great selection of products and the clothing are absolutely gorgeous! I especially like the shirts with the detailed collars and the scarf! Gorgeous! Very well detailed post and really like how you have include some tips and advice regarding your purchases. thank you very much for stopping by :))). You have such a sweet header! And so many beautiful products! Nice blog! I'm so jealous that you can go buy Korean products at a store. I think I would go gaga if I stepped into a store, and probably go WAY overboard on purchases. So it might be best that I can't, lol! I've only tried Etude House face masks so far and I love them! I'll have to try the C&F and Dermal ones. 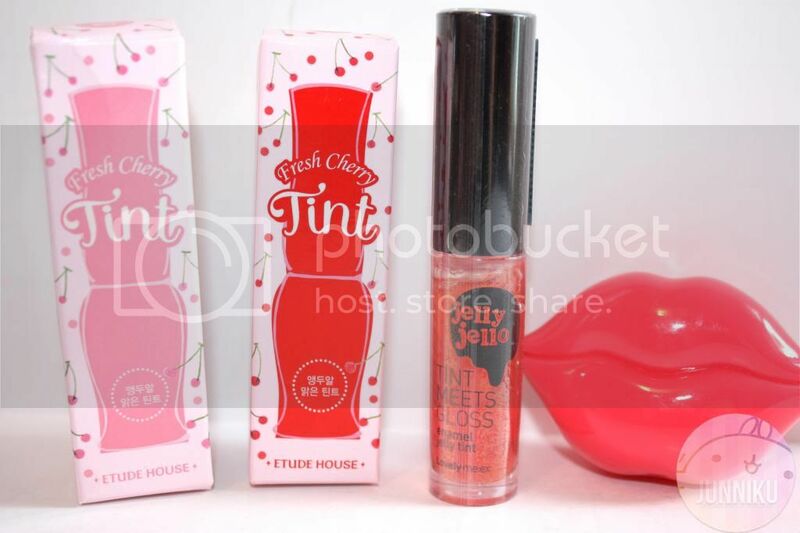 OMG WHERE WAS THE ETUDE HOUSE LIP TINT????? Omg you are so pretty!! and everything you bought was so cute <3 Just followed you ^_^ If you have time could you pleaase check out my blog? Wow that's a lot. I always wanted to go some korean stores but we don't have any here since I'm only living in a province. 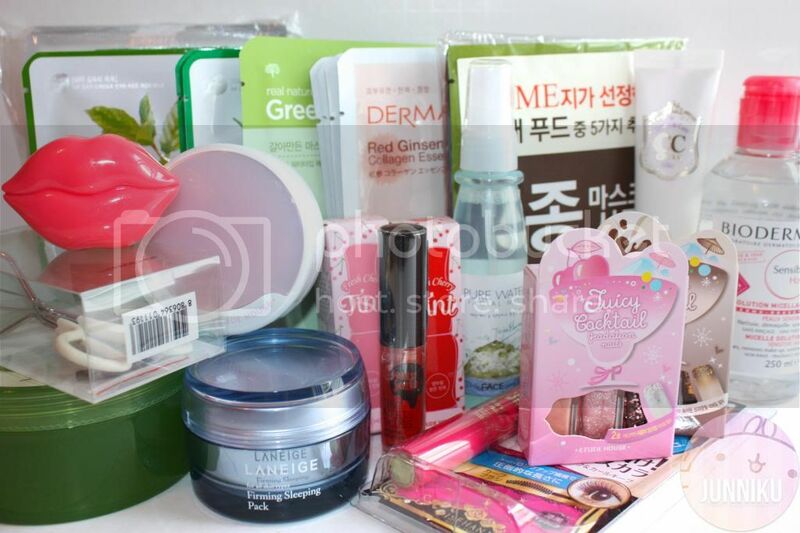 I usually buy some of the korean products that I'm using online. You are soo lucky.